A blend of chocolate and raspberry flavor rolled up to make a yummy cookie. These marbled cookies are not only delicious but they make a nice addition to your platter of holiday treats. Preheat the oven to 350 degrees F. Prepare the cookie sheet by lining with parchment paper. Heat the raspberries and 2 tbsp. of sugar in a small saucepan. Cook on medium heat, stirring continuously. Cook until berries have all disintegrated. Cook for approximately 5 minutes or until the mixture has darkened and thickened. Remove from heat and allow to cool. In a small mixing bowl, whisk together the flour, baking soda, baking powder, and salt. In another mixing bowl, combine the butter, cream cheese, and sugar; cream mixture together until light and fluffy, approximately 3 minutes. Add the lemon zest and whole egg; beat until well mixed. Add the egg yolk and cooled raspberry mixture. Beat until evenly mixed, scraping sides while mixing. Add in the dry ingredients and beat on low to moisten; then beat on medium until evenly mixed. 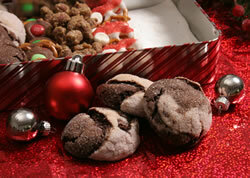 In a mixing bowl, whisk together the flour, cocoa powder, baking soda, and salt; set aside. In a large mixing bowl, cream together the butter, cream cheese, white sugar, and brown sugar until light and fluffy. Add the whole egg and beat on medium until well mixed. Add the egg yolk and then the vanilla. Beat until evenly mixed, scraping sides while mixing. Place the last cup of sugar in a small bowl for rolling the cookies in before baking. Now pinch off a teaspoon of dough and roll into a ball. Pinch another teaspoon off and roll it into a ball. Repeat this with the raspberry dough. Slightly flatten each of the 4 balls and then stack them on top of each other, alternating between the chocolate dough and the raspberry dough. Then roll all four pieces together into one ball. Roll in the sugar and place on the parchment-lined cookie sheet about 2 inches apart. 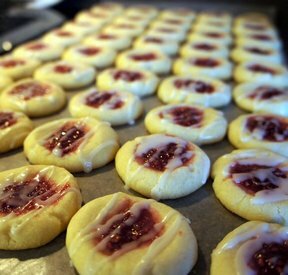 Bake in the preheated oven for approximately 13 to 15 minutes or until the edges of the raspberry dough is just golden brown. Do not over bake. 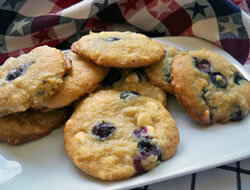 Allow the cookies to cool for 5 minutes on the cookie sheet before transferring to a cooling rack to cool completely. 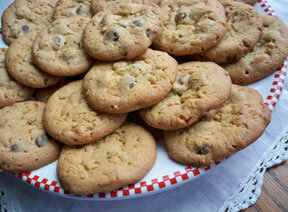 "Yummy cookies! Something different for Christmas. The chocolate and raspberry flavors are perfect together."